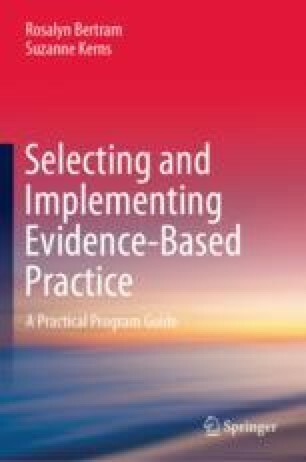 For a program or practice to establish a sound evidence base, it must proceed through a series of studies to determine its effectiveness. Similar to the story in the previous chapter, the initial trial usually occurs in ideal conditions, then progresses to studies in more so-called real-world settings. This can create a tension between internal and external validity. As programs are implemented in community-based settings, program developers should create written guidelines (manual) and fidelity measurements to help ensure it is implemented as intended. In this chapter, we review the most developed evidence-based approaches for common behavioral health concerns, including anxiety, traumatic stress, depression, and child behavior problems. We conclude with a discussion of the common elements movement and how different programs can be embedded within a system of evidence-based services to support a range of community needs. Dorsey, S., McLaughlin, K. A., Kerns, S. E. U., Harrison, J. P., Lambert, H. K., Briggs-King, E., … Amaya-Jackson, L. (2017). Evidence base update for psychosocial treatments for children and adolescents exposed to traumatic events. Journal of Clinical Child and Adolescent Psychology, 46(3), 303–330. https://doi.org/10.1080/15374416.2016.1220309.